GO Transit is the regional public transit service for the Greater Toronto and Hamilton Area. 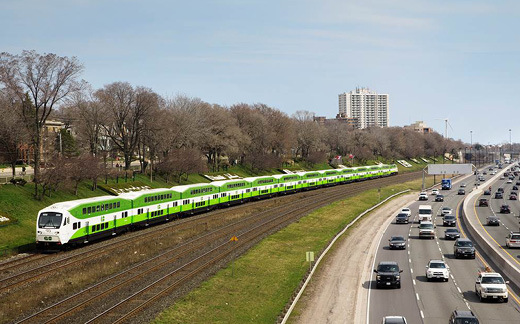 GO’s distinctive green and white trains and buses serve a population of more than seven million across more than 11,000 square km stretching from Hamilton and Kitchener-Waterloo in the west to Newcastle and Peterborough in the east, and from Orangeville and Beaverton in the north to Niagara Falls in the south. In operation since 1967, GO has evolved from a single train line along Lake Ontario’s shoreline into an extensive network of train lines and bus routes that carries more than 70 million passengers a year. We connect with every municipal transit system in the Greater Toronto and Hamilton Area, including the Toronto Transit Commission (TTC). In 2009, GO Transit merged with Metrolinx to combine both organizations’ expertise in strategy, planning, operations and implementation of building rapid transit projects faster and better, and improving the customer experience. For even more information, check out our New to GO guide. Check our service area maps to learn where we go. The original GO train service carried 2.5 million passengers in its first year of operation. Today, our trains and buses carry 70 million riders annually. At least 91 per cent of our train ridership is to and from Union Station in downtown Toronto, while about 33 per cent of all bus passengers travel to and from the City of Toronto. We manage over 337 km of Metrolinx-owned railway corridors, making up about 80 per cent of the total railway network that GO trains regularly operate over. By maintaining these corridors and nearly 500 km of tracks along with it, we help approximately one million train passengers get where they need to be safely and reliably every week. Learn more about railways in your community. We’re proud supporters of the United Way Toronto and are committed to supporting causes that matter to you. We believe in making a difference in the lives of people in need through donations and volunteer work.